The next few entries here are going to be a little different, but please bare with me. 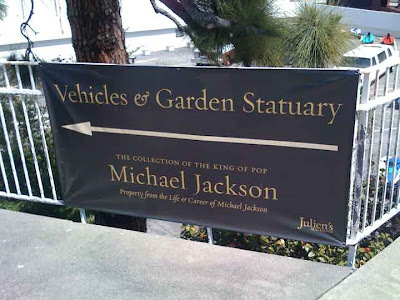 Back on April 19th, during my hiatus from posting, I had the opportunity to visit the display of Michael Jackson's collections that had been put up for auction, but removed from sale. 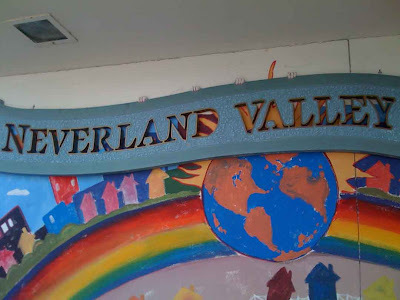 You can read the whole story elsewhere, but basically, much of the contents of Neverland Ranch were to go on sale, then removed from sale when Jackson arranged to do 50 sell-out concerts in London. 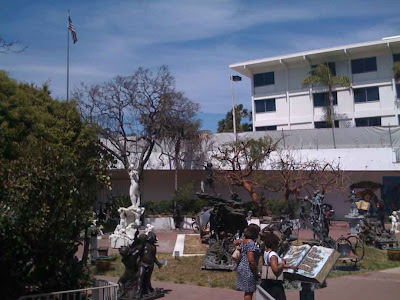 Though the auction was called off, Jackson's collections were still on public display for a couple of weeks. I went to this preview with an eye towards seeing a collection in an unusual situation: it was gathered together to populate and decorate a private world, then wrenched out into public light for all to see, and judge, out of context. 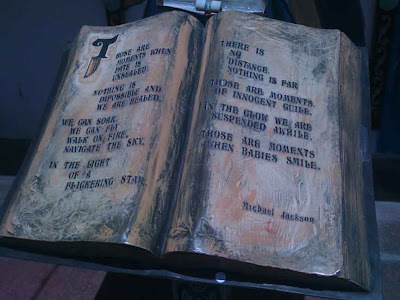 Michael Jackson was an amazing artist, and whatever else the case may be, he was clearly a troubled soul who, on some level, found solace in his collections. I'm offering up many more of the photos I took on that day than I had intended, to share the experience more fully. 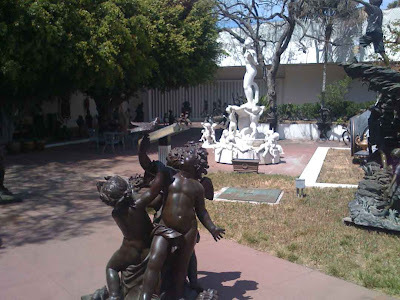 In this part one, we'll just take a look at the pieces exhibited outside. 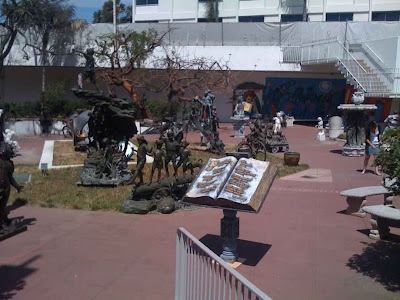 First off, the display was inside the abandoned Robinsons May department store in Beverly Hills, next to the Beverly Hilton, giving it an odd feeling. The whole place had a look of rundown retail opulence. 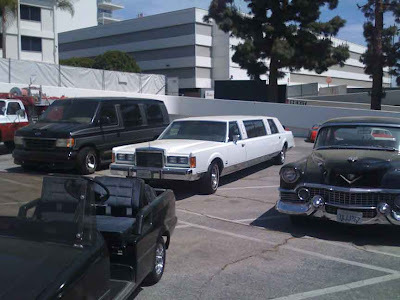 Below you see several of Jackson's vehicles, parked on top of the garage. 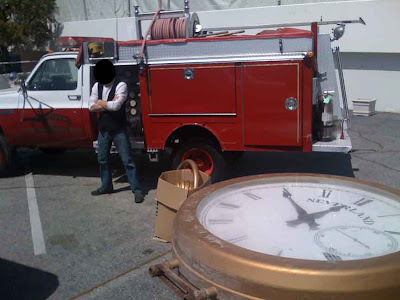 My anonymous friend posed with the Neverland fire truck, by a giant watch/clock. 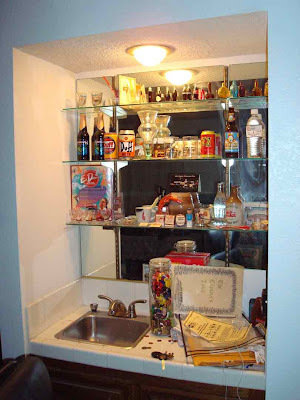 Notice,not much care was taken to preserve items or display them well. See the watch parts sticking out of the cardboard box? 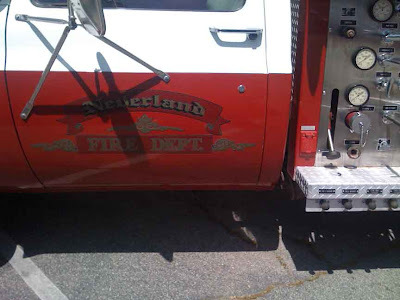 A detail of the fire truck. 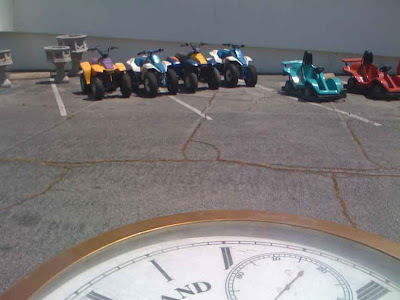 Mini bikes and planters, beyond the watch. 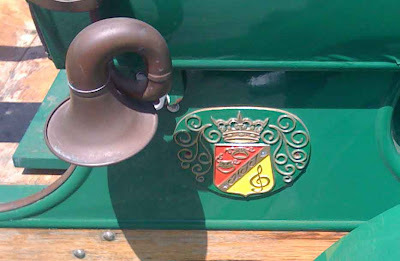 A crest on the side of this classic car - MJJ for Michael Joseph Jackson, as I understand it. The masks of comedy & tragedy, plus a musical note. 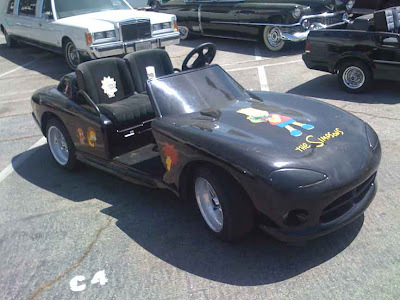 The Simpsons car - notice Bart & Lisa seats. 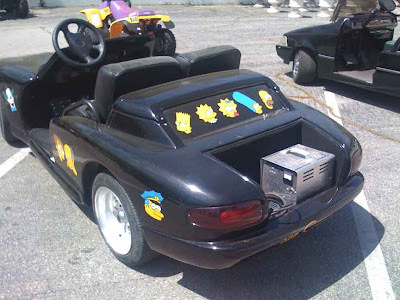 Rear of the Simpsons car - I believe it's electric? 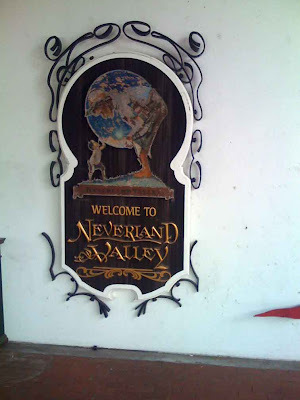 A "Welcome to Neverland Ranch" sign, displayed with a couple of planters. 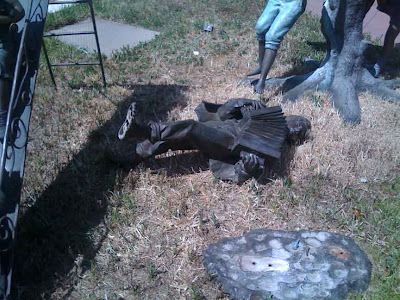 Jackson apparently collected many, many of these bronze statues of children, so Neverland must have never looked empty. This was on the second weekend of the public display of these items, and there weren't many people there. I imagine the biggest fans all came on the first weekend. 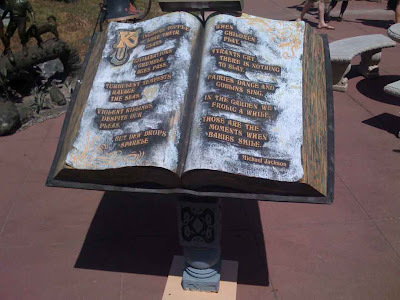 There were two books with this quote there, I imagine from different gardens on the Neverland property. A different book with a different quote. Again, little attention paid to the care of the items on display. 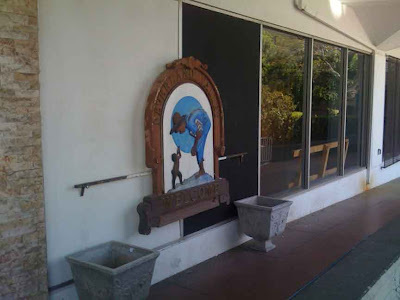 All in all, it felt like walking among the abandoned relics of a Disneyland, in an overgrown, forgotten courtyard. 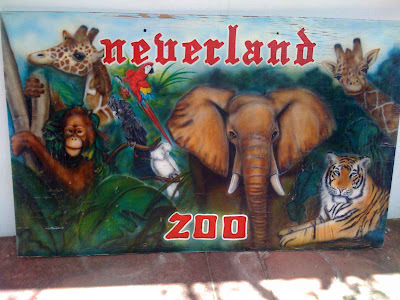 An odd juxtaposition created between a Neverland frame and graffiti artwork on the department store's exterior. 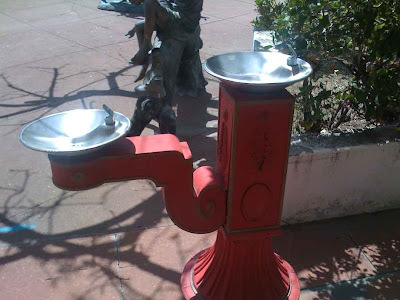 Water fountain with two levels - for adult & child to use at the same time. A lot of the pieces there had a surprisingly amateurish look to them. 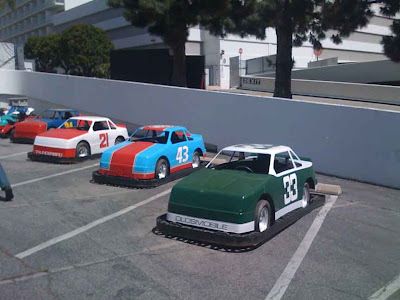 Note that hotel rooms at the Beverly Hilton looked over this unusual display. 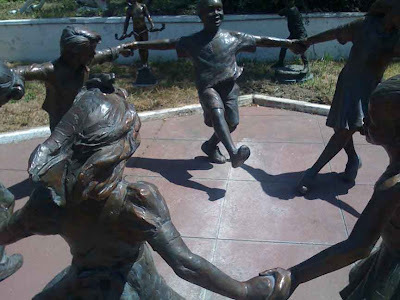 (I'd freak myself out imaging the statues were moving at night). 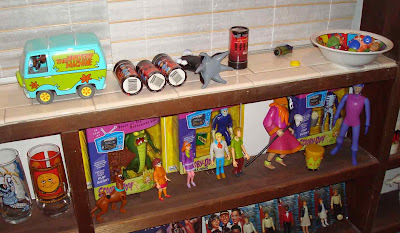 Many items were in an advanced state of disrepair. Was this all since Jackson left after the trial? 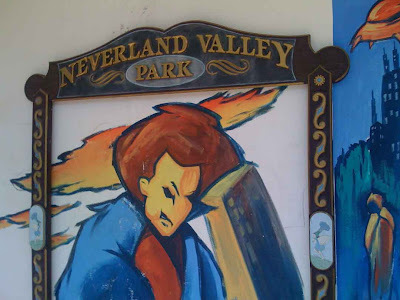 Again, Neverland art with graffiti on the department store. 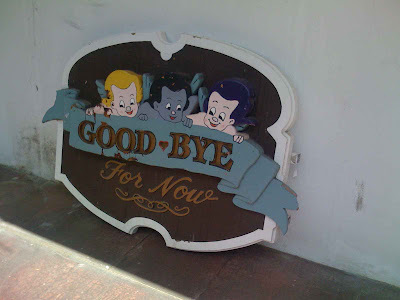 Some very Fantasia-esque cherubs on a goodbye sign. In fancollectorgeek, I like to stay away from negative observations, but I have to say this public display felt, well, creepy. 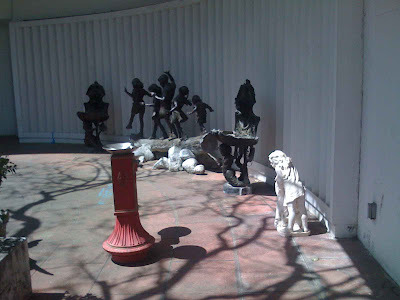 It may be too obvious to say the many, many statues suggest to me a fear of being alone. 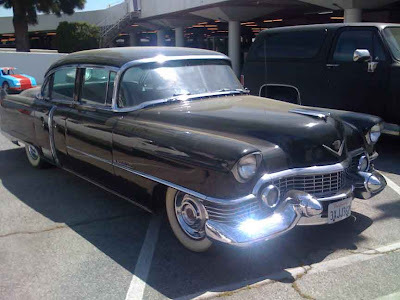 At the same time, it was kind of sad to see all this stuff that had been so cherished just unbolted and moved to be put on the auction block. 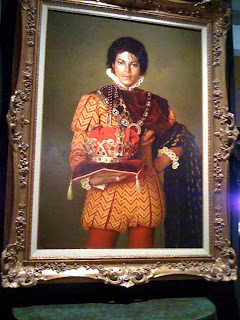 Next: inside, looking at Michael's collection of Michael Jackson memorabilia. 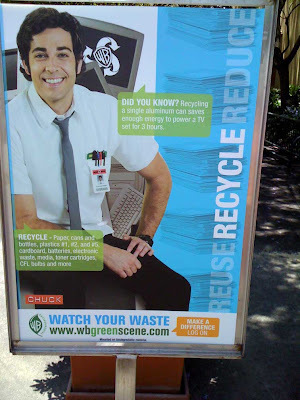 (Don't worry folks, more Big Bang Theory to come soon - and I'm not forgetting all you Restaurant ROw fans). Meanwhile, the anti-squirrel message evident in a recent animated film is clear on another lot nearby. Note: This is a joke. The squirrels there are actually very fat and happy. 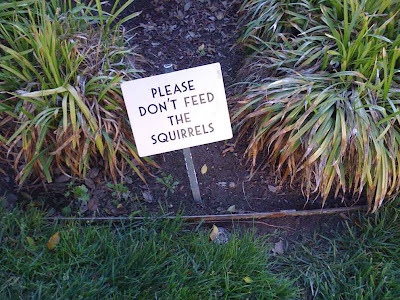 The sign is to keep them from becoming aggressive. You wouldn't like squirrels when they're angry, Mr. McGee! Prop collecting: Do you have an arm and a leg to spare? Any collector of TV or movie memorabilia knows that these days, actual screen used props cost a mint: the more important or unique the prop, the more it costs. 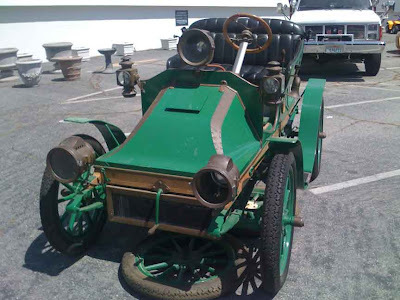 I saw the Holy Grail from Indiana Jones and the Last Crusade on sale in a memorabilia store by Disneyland for $10,000 dollars several years ago - and at that, you can't really be certain it was a real prop they were selling. Remember, it's easier to make a certificate than a fake prop, so don't think a "certificate of authenticity" means much on it's own. Consider who issued it. A Certificate from PAramount Studios would add a lot of weight to the validity of the prop; one from the store just doesn't mean that much to me. Enough said. 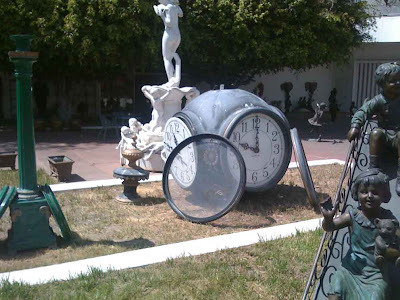 Sometimes, at least in Los Angeles, you can come across real props for real cheap - especiially if you're not too picky. 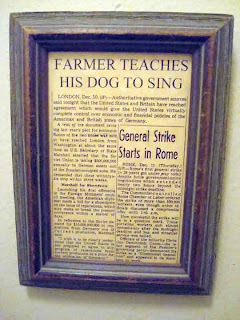 I bought the framed article above from a charity prop sale at a Major Motion Picture Studio about a year ago for the princely some of One Dollar. It has a production number on the back, and was obviously created with a particular show and scene in mind, but I actually have no idea what show or movie it was in. I just like it. If you have any idea where this was used - probably in a TV show - I'd love to hear it. This piece is now hung in a place of honor, right by the light switch in my bedroom, where I see it every day. As everyone who writes a blog knows, there's only one sure way to build your readership: stop writing for approximately five months. With each day passes without an update, regular readers become frantic for more, and new readers are constantly hearing about your site and getting hooked in, waiting desperately for a new post. That's why I haven't posted in so long. This is, of course, ridiculous. The actual reason I haven't posted in so long is in fact because I moved. Back in December I had the opportunity to buy a condo much closer to my office. This made the holidays a bit unusual this year - essentially happening while I was packing - and this year, I've spent most of my spare time working on fixing the place up. (It's very difficult to photograph, but you see here the "upholstery" he put on the walls; that's a menu from a Frasier DVD up on the screen). 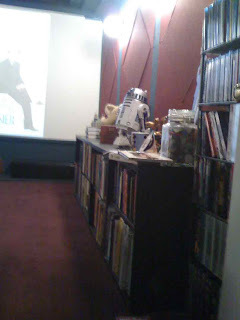 I made the place my own a bit by adding the bookshelves along the sides to turn it into more of a theater/library, and also house and display some of my larger collectibles. I don't know if it's going to stay there, but for now, it seems like as good a place as any. If anything, moving made me consider almost everything I have, as a collector; where it is and where I want it. I rediscovered things I forgot I had (like those Scooby toys) and in some cases, started collecting something that I hadn't actively collected in years when I rediscovered it. I'll be writing about all of this soon. And more. Just one thing you won't see anymore: Tales from Storage. It'll have to be replaced with "It Came From the Garage" because that's where it has all moved to now. I'm glad to be back to writing here. 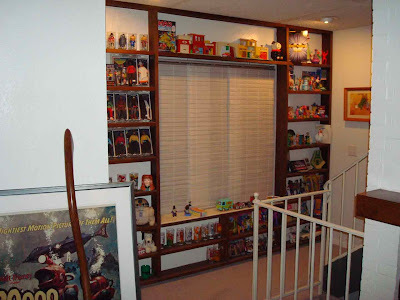 As always, my mission will be two-fold: to examine the nature of fan-collector-geekdom, and also, to bring up those interesting little things from my collecting, fandom, and childhood that don't seem to have made much of an impression on the internet yet. Also, coming soon - very soon: free stuff!